This was a spontaneous kinda plan. Every Good Friday we consider doing something worthy, like going to see the Passion Play in Trafalgar Square and we end up doing something completely different. Today was no exception. 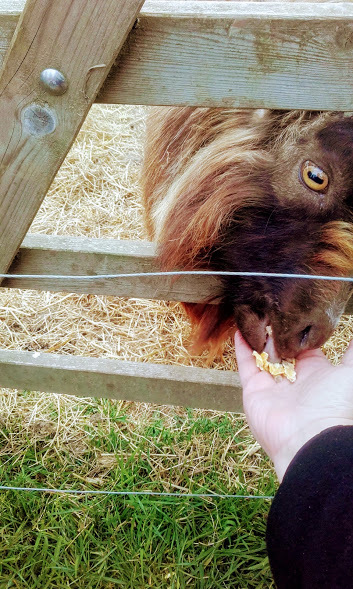 Miles away from Central London, we spent the afternoon at a farm park, and very pleasant it was too. Not *as* sunny as these photos make out but I’ll admit it, gentle reader- I’ve been playing with photo filters. We essentially answered a distress call. Like Obi Wan Kenobi, or the crew of Red Dwarf when they go to the Nova 5 and find Kryten tending a bunch of skeletons. This had fewer skeletons in it, but I did see some skulls in the tank where the boa constrictor lived. But we did come to the aid of a family who were facing a disappointing day. I could call them the JJ Aprams family, but the -ams bit was missing, so we’ll just go for JJA. It was lunchtime when we got there, so we started in the restaurant. 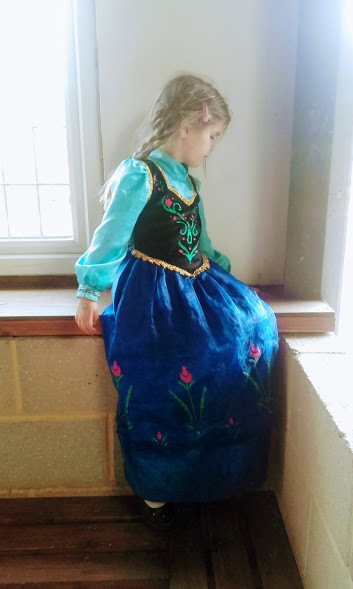 Eva – dressed as Princess Anna, naturally – sat and wrote out her alphabet while plaintively wailing about how hungry she was. Luckily service was swift and brought her and Roo sausage and mash pretty promptly. J1 had a giant jacket potato and Nathan and I had equally giant chicken burgers with chilli mayo and what looked like an entire tub’s worth of coleslaw on it. 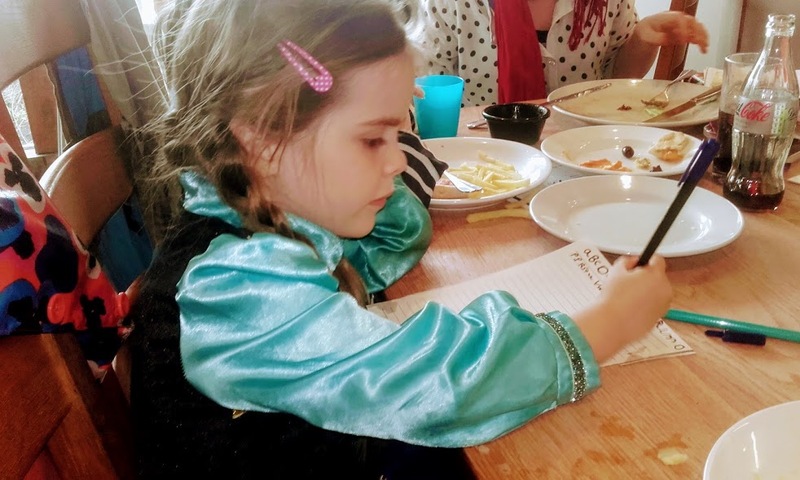 It wasn’t cheap – £5 for a kids meal. £11 each fpr ours – but it was goooood. A starter plate of warm pitta and homous was pretty tasty too, even if I disgraced myself by dropping houmous all over the chic wooden tables. 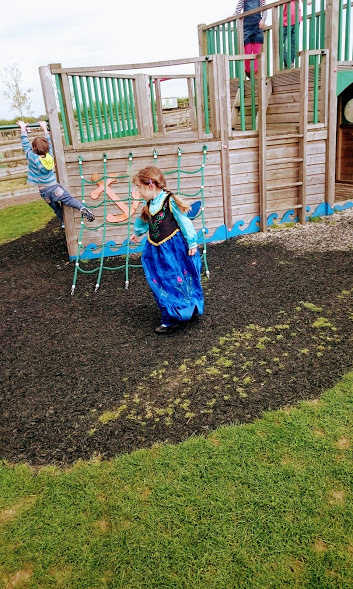 After lunch, it was vaguely sunny (not as sunny as this photo pertains to be) so we did the outdoor bits first before the soft play. 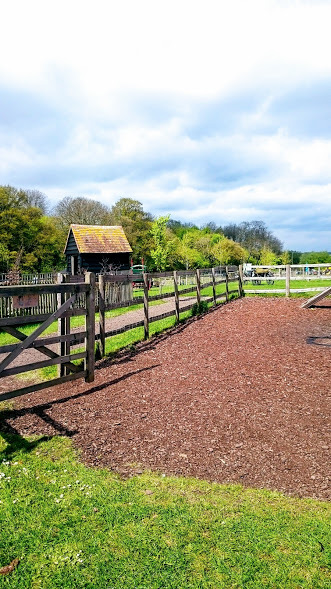 You can buy a ticket just for farm park or soft play but unless it was the depths of winter or the height of summer, I doubt you’d get away with only doing one. 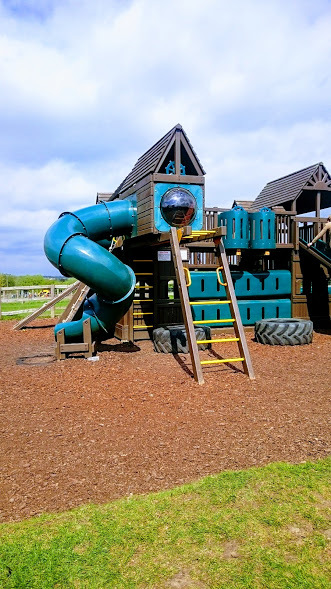 You have to walk past the soft play bit to get to the farm park, so the kids do notice and they definitely will comment if you don’t take them there. An important thing to note – the ticket counter does not take card payments, so it’s only by luck rather than judgement that I had the £15 cash on me to get the four of us in. The restaurant did take card, in case you’re wondering. Before long though Reuben tired of the small stuff and wanted to move on to the much bigger one. Eva went down the little slide and she loved it and then she told me that she needed the toilet. True story. 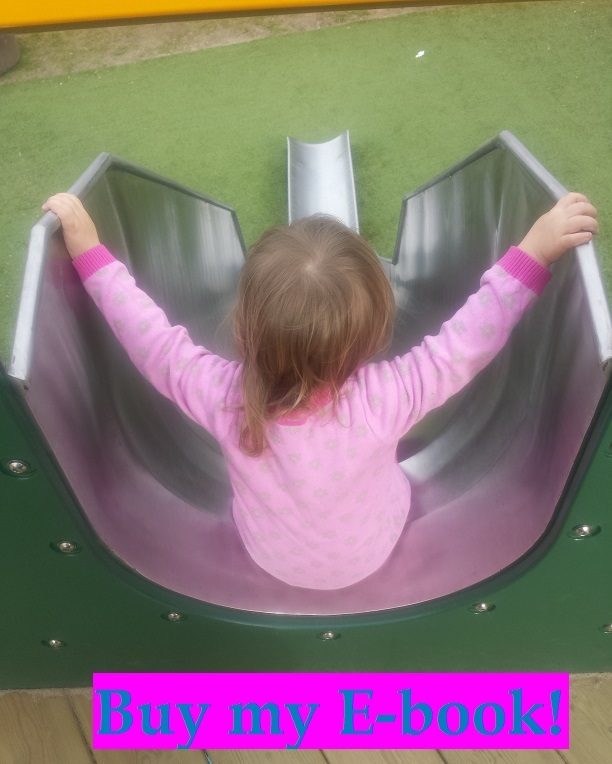 In her own words “I went down the little slide and I loved it and then I told you that I needed the toilet”. For those who need to know, there are two loos in the soft play area, one in the cafe and another building between the two which houses a few more. Handwashing points are dotted around the whole place. Which we needed because next up was some animal feeding. 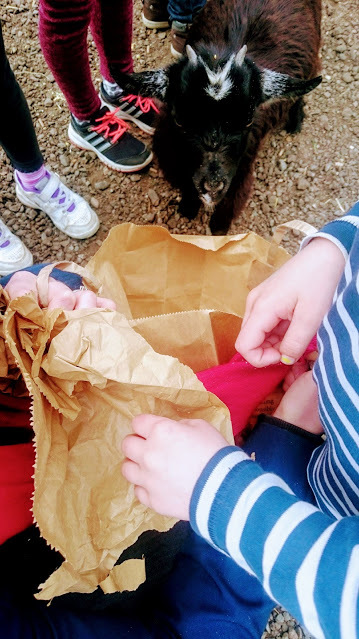 Eva was too scared to do it, but Reuben obligingly held his hand like a plate for a friendly sheep. 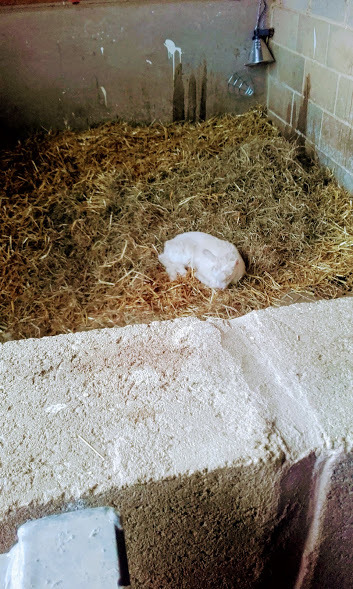 Then we wandered through the pet barn and saw the tiniest cutest baby goat. Talking of snuggling, we later saw some raccoons doing a little more than snuggling. To answer J1’s question from earlier, we can expect the babies in 63-65 days. Maybe we’ll go for Roo’s birthday. There were loads of other animals – a tropical room with an iguana, snakes and fish in and back outside there were emus, llamas and peacocks. And goats. 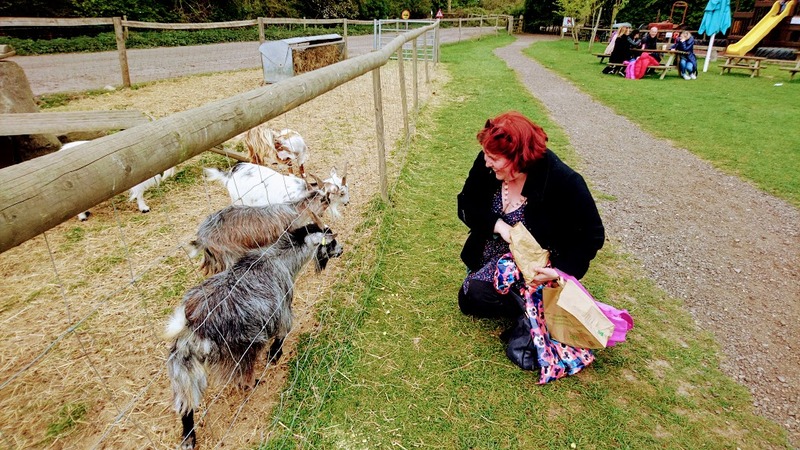 Oh yes, the goats. 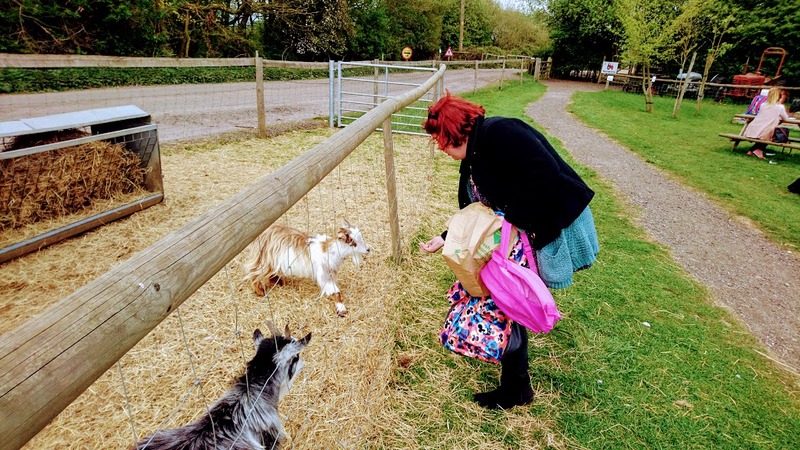 Years ago, when we visited a Hampshire farm park with my parents, Roo refused to go near the goats in case they ate his goats. I don’t think he was wrong to be paranoid. Goats are greedy beggars. I’d identified the one I liked the most – a little brown and white fella on the end. 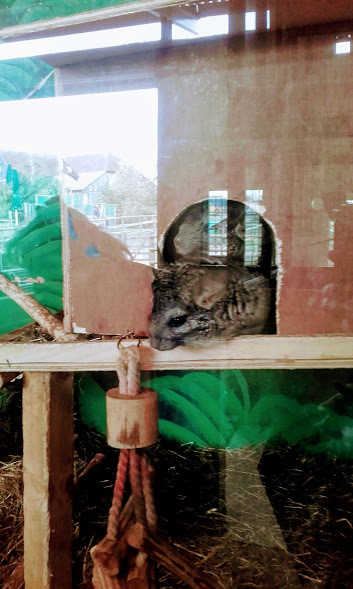 But every time I tried to feed him, he was barged out of the way by the big grey one and, in one instance, rammed right up the backside before I’d even produced the food. Greyster was taking a pre-emptive strike. And when I did hold my hand out, they were all on me. It was scary. We briefly stopped at the last playground but it was 3:30 by now and soft play closed at 5, so we headed inside. J1 shouted Nathan and I some much-needed caffeine as we’d run out of cash entirely and we watched the kids run around and exhaust themselves. Eva was even so sweaty she agreed to take her full length princess dress off. And that’s all I’ll say about kids and clothes for now. This entry was posted in Food in cages! Walking around! Or maybe some alpacas! 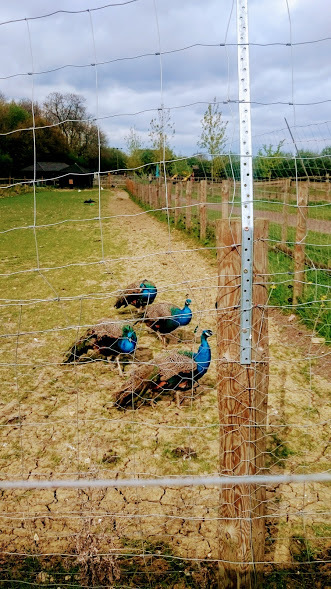 (Farms and zoos) and tagged animals, eating out, farms, outside London, soft play. Bookmark the permalink.